Footballer Motherwell, Leicester City, Leeds United, Coventry City, Liverpool. Gary started his senior career with hometown club Motherwell before moving on to Leicester City. With the Filbert Street club the cultured midfielder was named in the Second Division PFA Team of the Year in 1988-89 and 1989-90. In 1990 McAllister won a big move into the First Division with Leeds United and playing alongside Gordon Strachan he had an important role in the Championship winning season of 1991-92 and the FA Charity Shield victory in 1992. McAllister would be named in the First Division PFA Team of the Year for 1991-92 and the Premier League PFA Team of the Year for 1993-94. McAllister captained Leeds to the final of the League Cup in 1996 although the club ultimately lost to Aston Villa. Despite being over the age of 30 McAllister signed for Coventry City in 1996 for the sizeable fee of £3 million. A surprise move to Liverpool in 2000 brought an impressive haul of silverware and McAllister’s performances in his two year spell at Anfield secured his iconic status at the club as they won the FA Cup, League Cup, FA Charity Shield, UEFA Cup and UEFA Super Cup. 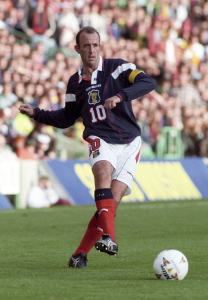 Between 1990 and 1999 McAllister won 59 Scotland caps, scoring five goals, and played at the UEFA European Championship tournaments in Sweden in 1992 and England in 1996.